No matter your level of familiarity with Manga or Anime, chances are you’ll have heard of Attack On Titan. Frequently dubbed “The Walking Dead” of Japan, the acclaimed series is set a world where humans live in fear in cities surrounded by enormous walls, a defense against the Titans – gigantic humanoids that eat humans seemingly without reason. And whether you’re a die-hard fan or a slightly intrigued observer, Kodansha Comics have just the thing for you. 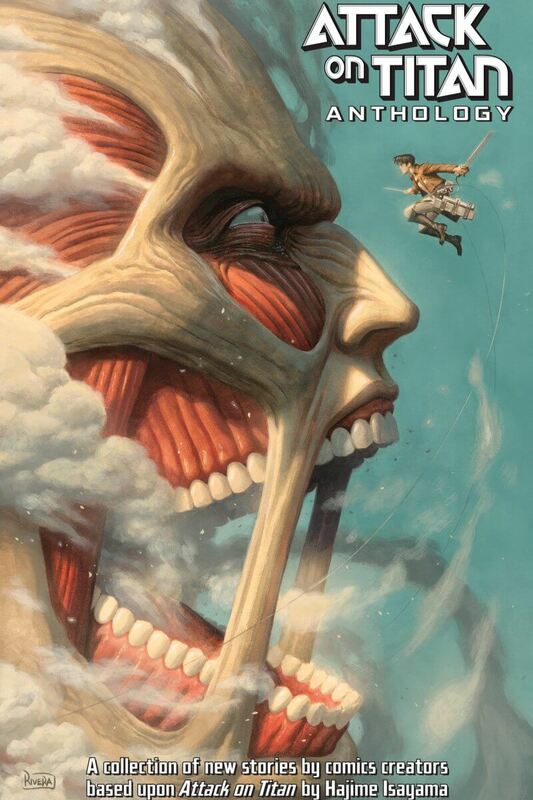 Attack on Titan Anthology is a full-colour, 256-page book featuring some of the most acclaimed comic creators in the West – including the likes of Scott Snyder, Gail Simone, Faith Erin Hicks, Michael Avon Oeming, Rafael Albuquerque, Cameron Stewart, Babs Tarr and more – each crafting their own original stories set in the world of the manga megahit. While it may have flown under the radar somewhat when it was originally announced around this year’s NYCC, we simply had to find out more, and were thrilled to be able to sit down with editor Ben Applegate to dig in a little deeper about the genesis and evolution of the project. BIG COMIC PAGE: Thanks for your time, Ben. Firstly, tell us a little bit about how this ambitious project came about and how you ended up being involved? BEN APPLEGATE: The project came about during a trip to the Kodansha Japan offices by some of the Kodansha USA team in November 2014. With comics and manga adding more and more American readers each year, the folks at HQ were interested in how they could do more to serve an American audience specifically, and the anthology was one idea that came out of that discussion – by far the most ambitious, as you mentioned. So I’ve been on the project from the beginning as one of the editors, with the support of the Japanese creative team and the Kodansha execs. BCP: What was your role in the project? BA: I was one of two editors, along with Jeanine Schaefer, a veteran who had just left Marvel at the time. Jeanine did most of the work assembling the amazing talent for the book. Since I also edit the English edition of the Attack on Titan manga, I was on hand to coordinate between our creators and the Japanese editorial team, which was passionately interested in the project. I was there to suggest settings, characters, etc. and pass along feedback from the Japan side, but mostly we gave the creators free rein to go where they wanted to with the material. I was incredibly gratified to find that Hajime Isayama, the creator of Attack on Titan, was very flexible in how he allowed non-Japanese writers and artists to play in his world for the first time. BCP: You’ve managed to assemble a veritable All-Star team of comic book talent for this one. How did you go about pitching the anthology to them? BA: The book really pitched itself. Most of the creators already had experience with Attack on Titan, whether the manga or the anime, and were immediately excited to be some of the first Westerners to get a chance to create original comics based on a big hit manga. Babs Tarr, Cameron Stewart, and Brenden Fletcher, the Batgirl team (now the Motor Crush team, I suppose) cite Kodansha manga as major influences, so they were gung-ho from the start. I believe Gail Simone’s response was something like, “I have to do this! I’m going to be a hero to my kids!” And Evan Dorkin said he felt the Colossal Titan was “stalking him.” I’m not sure what that means, but he was in right away as well. I have similar stories for everyone in the book. There really was universal enthusiasm. BCP: Were there any limitations or guidelines given to the creators before putting together their individual stories or were they given a blank slate to work with? BA: We were looking for as wide a variety of tones and narratives as possible, so we tried to keep the slate as blank as we could, with a few caveats: We wanted the stories (the serious ones, at least) to feel like Attack on Titan, and we wanted some stories that connected to the Attack on Titan world. By “feel like,” I mean we needed them to integrate the fears that Titan taps into. This is something that I feel Si Spurrier and Scott Snyder grasped especially quickly. Their stories both take the concept of the Titans as an avatar of primal fear in different but interesting and frightening directions, and they feel like Attack on Titan stories, even though their settings don’t have much to do with the main series. Of course, the stories set in the manga universe were much more challenging to edit, since we had to make sure they fit in with the story that Isayama is telling. The creators and the Japanese editor were extremely patient with that entire process. I think the results, particularly in Genevieve Valentine and David López’s “Illustrated Guide to the Glorious Walled Cities,” Michael Avon Oeming’s “Live and Let Die,” and Rhianna Pratchett and Jorge Corona’s “Skies Above,” are going to be exciting and emotional for fans and new readers. BCP: Was there anyone you’d have loved to contribute to the anthology to the series but weren’t able to secure? BA: Of course! But there’s always next time, so I’d rather not name names. I will say that we were amazingly lucky to get most of our top choices into the book. BCP: What is it about Attack on Titan that you think resonates so deeply with creators and fans alike? BA: Well, to its target readership of young people, it’s easy to understand the main character’s frustration with being trapped inside a walled city. Being told it’s for your own safety doesn’t make being stuck somewhere dull any more fun. But what’s really hooked readers of all ages, I think, is the grown-up attitude toward its genre. Violence is not the answer to all problems, and even justifiable violence carries a heavy price in a cruel world. No matter how dire the circumstances, there will always be people working for their own self-interest against the group as a whole. It’s difficult to live looking or acting differently from other people, especially when those differences remind them of shortcomings they would rather forget. All of these are universal themes that don’t often get such a complex treatment in shonen manga. BCP: Given the inclusion of such well-regarded comic creators, do you see this anthology as being something a gateway for new Western readers to encourage them to check out the main Attack on Titan manga series? BA: I certainly hope so. I think Attack on Titan is readymade for American comics fans to pick up. It’s got some of the flavor of a modern superhero ensemble comic, the gore and human drama of a classic Vertigo series, and action scenes that I’ve heard lots of readers describe as “steampunk Spider-Man fights giants.” There have been a lot of comparisons made to The Walking Dead and Game of Thrones. I know this isn’t accidental, since Isayama and his editor are both big fans of American pop culture. (In fact, when I met the editor for the first time, he was wearing a vintage Ren and Stimpy T-shirt.) So I’d encourage Western readers to give the series a shot. We’ve even released it in a large-size format (the “Colossal Edition”) that will be familiar to anyone who owns the Walking Dead compendiums. BCP: Any plans for similar anthology projects in the future, or was this a one-shot deal? BA: We went into this with big plans in our back pockets, and we’re in the middle of finalizing those now. I should say that we’re not going to limit ourselves to the same format as this anthology, and we’re not limiting ourselves to Attack on Titan either. If things keep shaking out as they are, we will likely have an exciting announcement to make at Emerald City Comicon this coming March. BCP: And finally, if you could say one thing to readers who are on the fence about this one to help encourage them to pick it up, what would it be? BA: This is a cross-cultural collaboration the likes of which has really never happened in comics before. The result, setting aside the Attack on Titan name, is a collection of beautiful comics, representing the entire spectrum of sequential art being done today. Whether you’re a longtime fan of Attack on Titan or have never read it before, whether you’re a fan of these creators or exclusively read manga, I think you will encounter a few things you will love, maybe more than you ever thought you would. The Attack on Titan Anthology is available now from the Kodansha Comics website, and you can find out more about the project – including interviews with Paolo Rivera, Jorge Corona, Tomer Hanuka, and Genevieve Valentine – on the official Kodansha YouTube Channel. Oh, and if that’s not enough, we’re thrilled to present a 10-page story from Scott Snyder, Ray Fawkes and Rafael Albuquerque entitled “Beneath The Surface” in its entirety below!